Since 1987, ADMARIN DCC is taking part in construction and delivery of ships and ships equipment as co-partners with associate shipyards. Starting with Tuzla Gemi Endüstrisi A.Ş. for manufactoring ships equipment for international market such as hatch covers and loading equipment in 1987. In 1998 ADMARIN DCC took part in setting up of the RMK Shipyard and act as co-partners until 2005, during that time which they succesfully built two navy ships for the Turkish Navy and various tankers for west European owners such as Petrogas Atlantico, Herning and Unifleet. 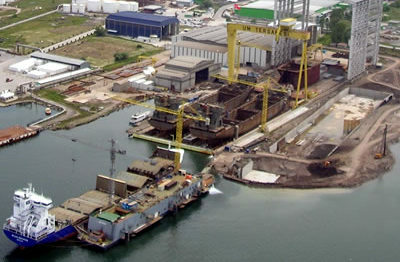 From 2005 to 2009 ADMARIN DCC was the founder and major share holder in Admarin Shipyard A.Ş. in Kosbaş Free Zone / Kocaeli. Presently ADMARIN DCC is the co-partner and prime designers for UM Shipyard which is the biggest third generation shipyard in Turkey.